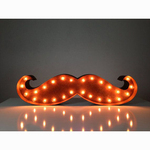 These vintage inspired lights are the perfect way to personalize a room. 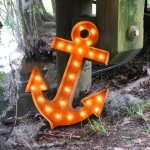 The Ampersand, Fleur de Lis, Texas and Anchor are great ways to add a bit of whimsy to your life. Colors and finish vary, to add rustic charm to each sign. The C9 light bulbs are included and up to 4 Marquee Lights can be linked together if needed. Each light plugs into a regular outlet.